Police say they have linked six armed robberies that took place in the Worthing area in the last four weeks of August. Sussex Police are hoping to trace any witnesses and believe a man pictured on CCTV in a shop in Sompting could help. The spokesman added: “The first robbery was a taxi driver who was threatened with a knife in Orme Road on August 8. “The second was at Sompting Mini Market in Seadown Parade in Sompting on August 13. “The third was at Ladbrokes in Rowlands Road on August 18. “The fourth was on August 20 in Railway Approach, Worthing. Two victims were approached by a man who demanded their money after being threatened with a knife. Detective Inspective Alan Pack said: “At the robbery in Sompting we have a CCTV image of a man we believe was in the shop at the time of robbery and witnessed what happened. “Is this you or do you recognise this man? We are keen to talk to this witness as he may have vital information that may help us. “We are linking all these robberies as they are all within the Worthing area and they have similar suspect descriptions. Members of the public with information can notify Sussex Police quoting Operation Zinger or anonymously via CrimeStoppers 0800 555 111. 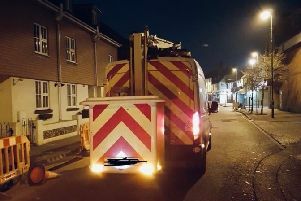 The police spokesman said: “A 22-year-old man from Lancing has been arrested on suspicion of robbery in relation to the incidents in Orme Road, Seadown Parade and Rowlands Road. He has been bailed until 29 September.